Villa Shantiasa is located within the beautiful rice paddies of Karangasam, Sidemen. This two-story holiday villa has four luxury rooms and each room (2-persons) has an en suite private inside bathroom. All the rooms are separately for rent. Note: wishing to rent the house for ‘only private use’, please contact us by the page Contact. Two rooms on the ground floor and two rooms on the first floor. Double beds available in the four rooms. In case of a request for twin beds, this is available to prepare in one room. The rooms have connecting doors (2-door system), which is ideal for families with children. Note: an extra bed on the room(s) is possible, please check the page Rates. 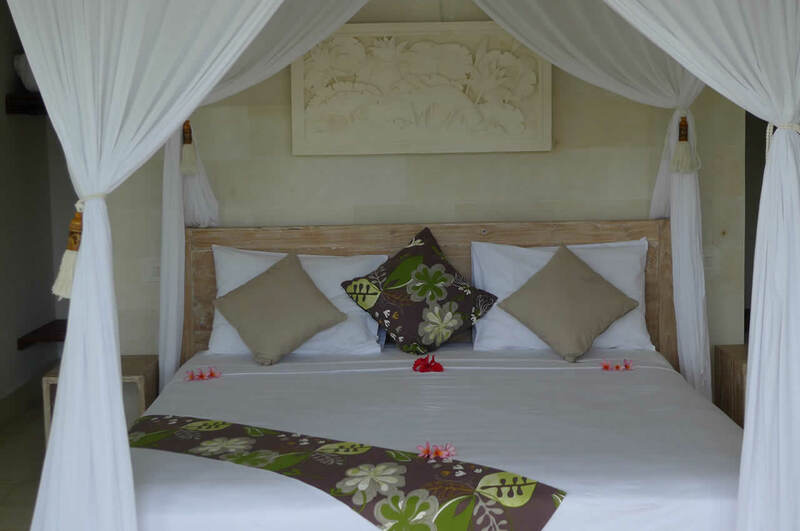 All the rooms and bathrooms are decorated within the design style “Bali Modern”. Comfortable items combined with authentic Balinese interior items. The double beds (twin beds) can be covered by a romantic mosquito net. The lighting is suitable for atmospheric moments as also for relaxing reading moments. All the rooms are situated for enjoying the amazing views on the Sidemen valley. From a restful moment on the romantic bed or while sitting on the terrace/balcony in the lounge teak wooden chair, the stunning views will make your stay unforgettable!